The storm broke this morning or at least the rain abated. Yesterday’s low clouds shrunk our horizon and released a well of rain that soaked me during an early morning walk. The locals made sympathetic sounds and assured that the storm was unexpected during May, a time known for its good weather. After morning porridge we start down the road to Cuil Bay. The sunlight that encouraged us to hurry breakfast is gone but we enjoy the great brown cattle grazing in an adjoining field as they did during the worst of yesterday’s deluge. Their wet coats glisten in this diminished morning light. A small bird of prey glides by, its body cutting across the now visible hills where shafts of sun mottle the green with lights and darks. We move past a line of thick walled white cottages with yards decorated by blooming bushes and the bright blossoms of a golden chain tree. The tree reminds me of home for its twin grows along the Seward Street Steps. 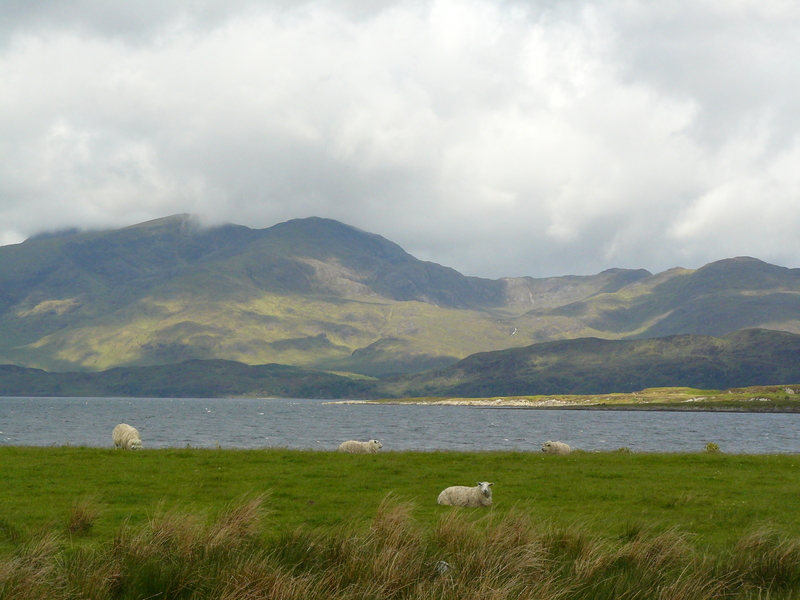 Two sheep block the path but voluntarily rejoin their flock grazing on a field by the loch. They share it with four Canada Geese who take noisy flight when a border collie approaches. Ahead the path, now gravel, forms a curing line toward a low slung cabin half hidden on a rocky headland. Tinkers have parked four caravans between the sea and path along side a “No Overnight Parking” sign. An overturned tricycle lies nearby. They come for the spring tides to harvest mussels for sale. They come each year. I leave the path and follow a small burn (stream) to where it joins the Loch. Across the loch’s still disturbed waters sunlight strikes a nearby island then moves on to illuminate the surf at my feet. This seems to release energy built up in the sea by the storm and in me. I find my spirits rise, released by the cap of caution I always set over emotions during times of disappointing weather. Another stronger storm now lashes at our B & B this morning. It doesn’t bother the wood pecker in our host’s garden but a late arriving pine martin chases him away. What could have tempted the big mink like critter away from his comfort on such a morning? Rain soaks us during the short walk to our friend’s car and we ride all the way to Oban in a downpour. There we board a two car train south. I am assured the view would be lovely if we could see it through condensation on the windows. Our assigned seats place us next to a local minister on his way to Edinburgh who shared my appreciation of Jimi Hendrix and Neil Young, and the value of daughters. He has four. Sunshine replaced the storm at Edinburgh but the wind blew with greater and greater strength as we passed through the borderlands and down to Newcastle. 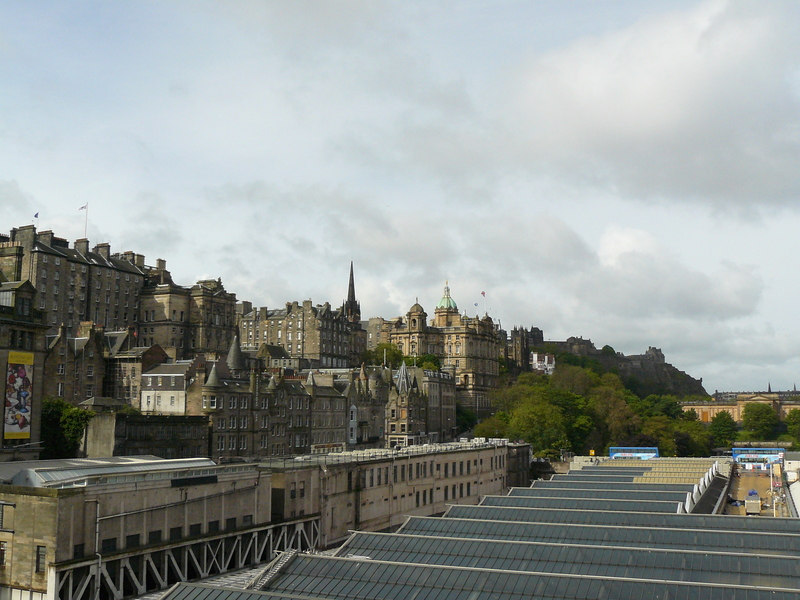 Later we learned that they suspended train service in Scotland after we passed through when a new storm made it too dangerous to travel. Several people died in the hours after we moved south. This entry was posted in Dan Branch, Kwethluk, Nature on May 26, 2011 by Dan Branch. 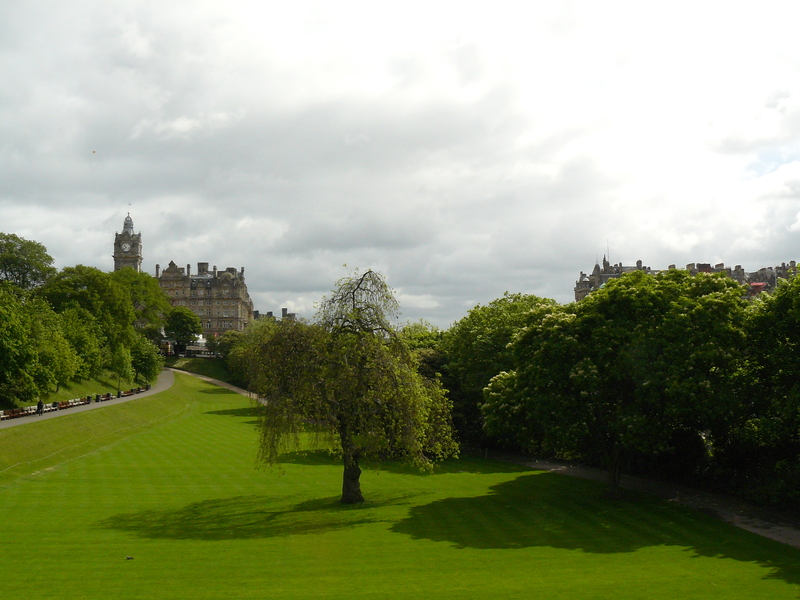 With Aki hunkered down on Chicken Ridge her human family flew to Edinburg — a place different in time, place, architecture but not weather. That makes us feel at home as does the pure light shinning on the castle walls. Minutes ago it rained, which is rude for a traveler when the temperature is in the 40’s. The town hasn’t changed much since Scotland signed a unity pact with England, which stopped periodic attempts of those southern neighbors to destroy the town. The resulting uniformity makes the town a Georgian forest of stone. Its a place to expect funeral processions around each corner. 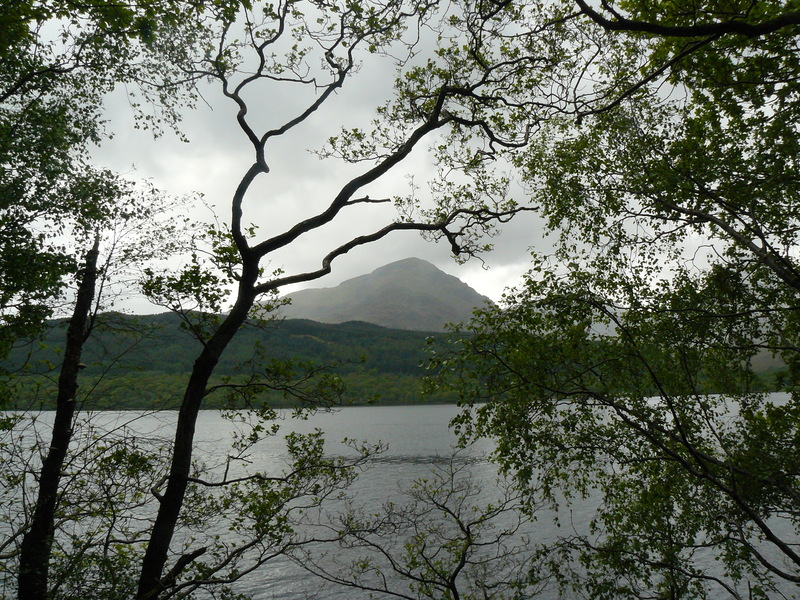 We leave the city for Loch Lomand and the surrounding mountains where blue hyannith flowers carpet the forest ground. There is a green leafed beauty here that links us with home. 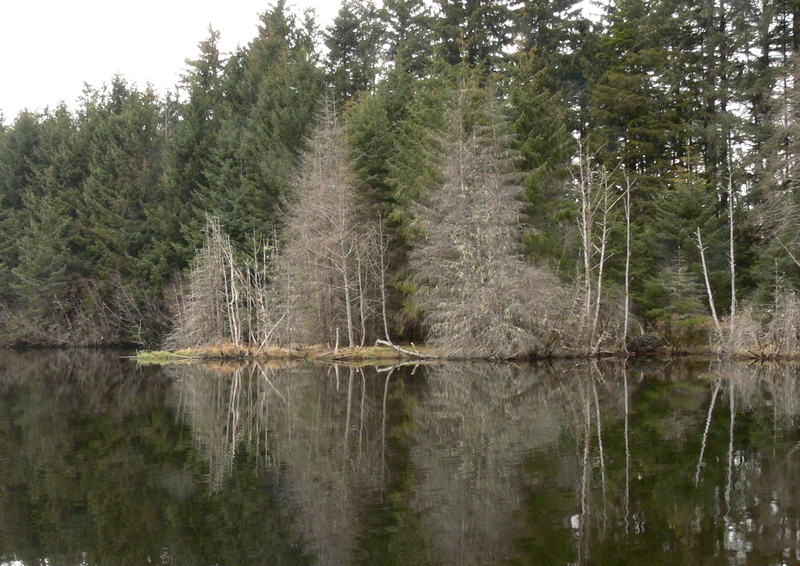 This entry was posted in Aki, Dan Branch, Kwethluk, Nature on May 21, 2011 by Dan Branch. Today Aki and I visit an old friend — the moraine trail. Sunlight melts the remaining snow and rouses mosquitos. Soon these pests will close the more interesting sections of this ground where lightly traveled paths cross thick blankets of moss and skirt pot hole lakes. From such a path I spot a pair of Mallard ducks quietly feeding a few feet away. Aki, exploring ground recently mined for roots by a bear never sees the birds. They glide out of sight, every detail of the drake’s beauty emboldened by early morning light. Even the hen’s subtle coat of gray and brown draws a second glance. Being so close to the glacier, this ground recovers slowly from winter. The animals of summer must wait patiently for the bust out of spring. Things are changing. The manic chittery bird sounds of winter harvesters has been replaced with long sweet love songs. When a bright yellow warbler lands near us on a still bare willow I know summer is near and silently urge these willows and alders to get on with it. Minutes later we reach the little wooden bridge that crosses a long thin pond. Each year meadow grass claims more and more of the pond. 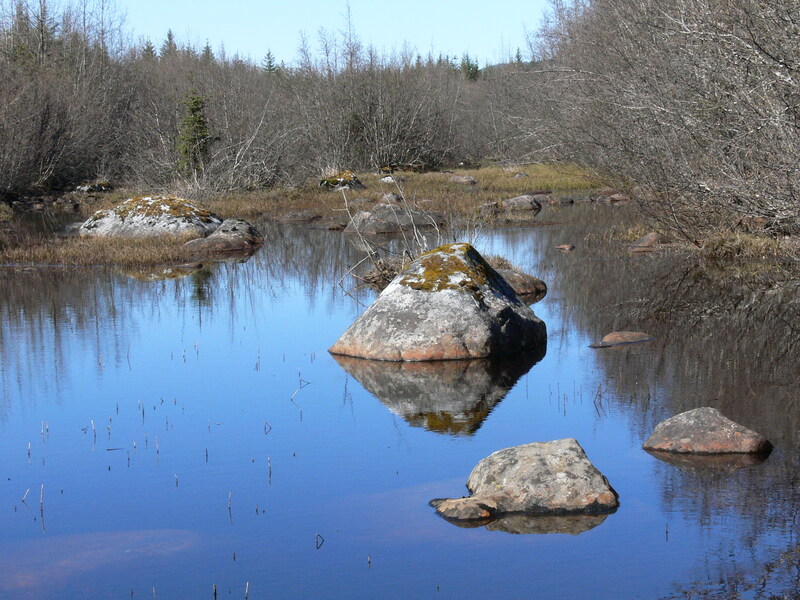 In my life time it will disappear but for now there is enough water to surround a handful of small glacier erratics that have spaced themselves like a chain of islands in the pond. I can’t explain the draw of the scene other than that it calms me like views of a Japanese rock garden. Behind a mountain blocks half the sky. With a ten minute walk I could have a world class view the glacier. We return to the moss covered forest path as I carry the image of rocks reflecting in a dying pond back to the car. This entry was posted in Aki, Dan Branch, Juneau, Kwethluk, Nature, Southeast Alaska on May 15, 2011 by Dan Branch. The morning sun is a pleasant surprise as are the killer whales making expanding circles on the calm channel waters as they break the surface. From here they look like feeding trout on a pond. 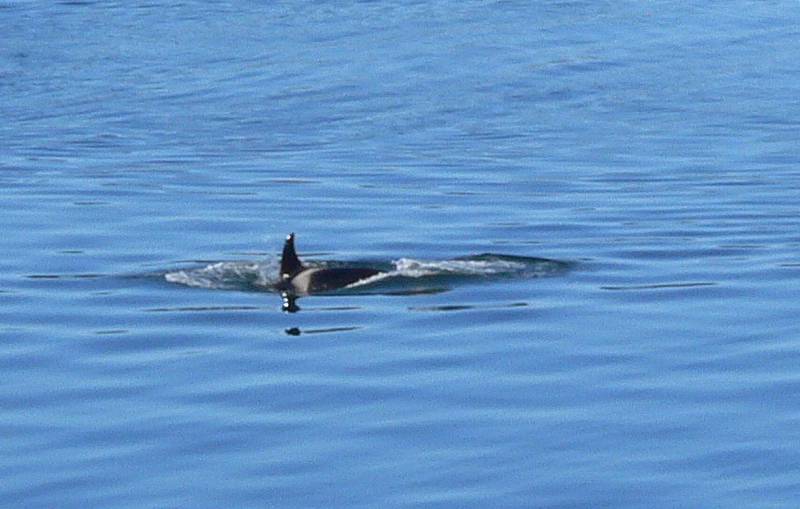 One breaches, throwing its body up to crash on its back into the sea. It is a glorious thing to see. The rest of the pod, a dozen or so, fed on homeward bound salmon. Excitement of seeing them makes me useless with the camera. After a few efforts I turn it off and listen to their rhythm — the crash of surfacing, air forced through to clear their breathing tubes, the crash of retreating under water. In truth Orcas lack the graceful form of larger whales but seeing the early morning light catch a male’s glistening dorsal fin, well that is more than enough. The whales push on and so do we to a creek side trail out the road. The creek would be called a river in a land less blessed with waterways. It one of the streams we have not clouded with glacier silt. On this sunny day, the light drives right to the creek bed, defining each pebble. 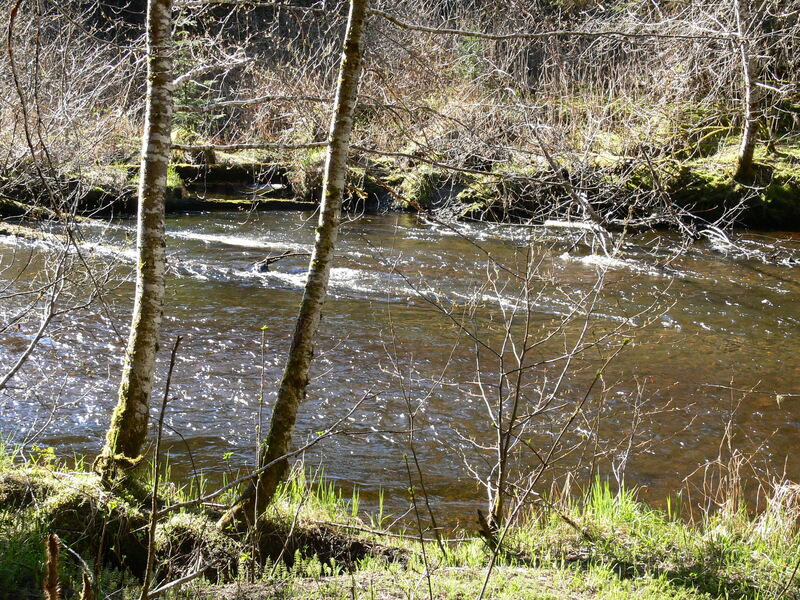 Later in the summer sunlight will reveal the dark bodies of spawning salmon. Eagles will hang like vultures in the creek side spruce and we will constantly be on the lookout for bears. Today the water is as empty as the alder branches are bare. We walk alone along it to the sea. After a mile or so we break out of old growth onto a great grass meadow where wild iris and chocolate lilies are already forming flower buds. 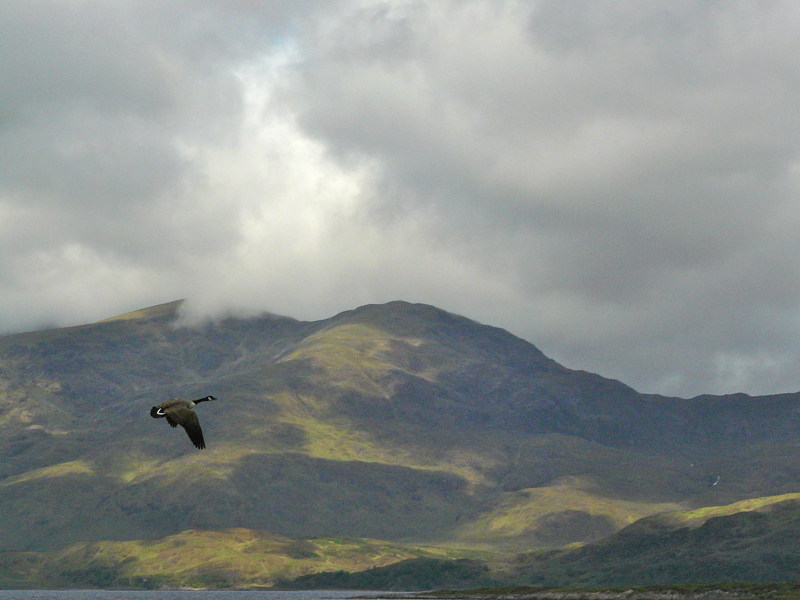 Great white mountains rise above it at all compass points. Aki runs mindless over this field of still dormant grass as I search for the first Shooting Stars. When the meadow reaches summer mode those flowers will form magenta islands on a sea of green grass. My father loved the Shooting Star from the time he first found one near his Montana home. He was dead before I found my first one in Alaska. He would love to see Shooting Stars blooming here in June, like he would have loved his granddaughter and the light sparkling on this creek water. I wish he could have started this day with me, Aki and the whales. This entry was posted in Aki, Dan Branch, Juneau, Kwethluk, Nature, Southeast Alaska on May 14, 2011 by Dan Branch. This is a day for firsts. The first fog horn bellow welcomed the first cruise ship. That woke us up in time to see fog filtered light highlight our emerging lilac leaves. 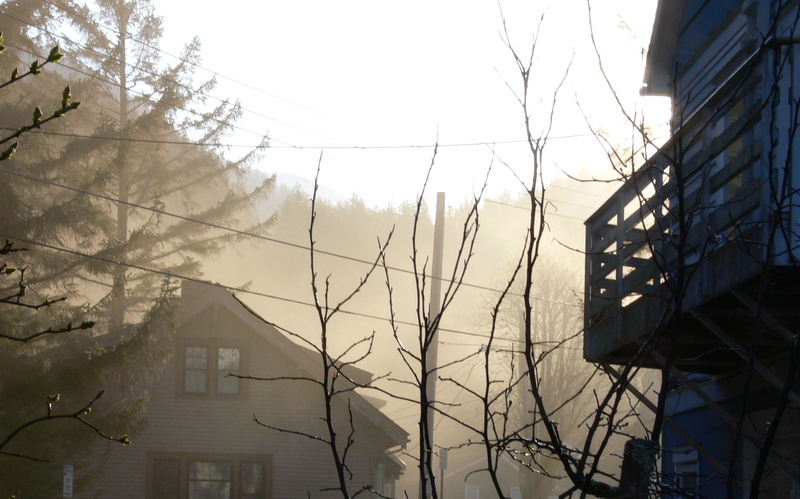 After the fog burned off Chicken Ridge I played Handel’s Fugetta on the guitar, warmed by the sun on our front porch. Another first for the year. 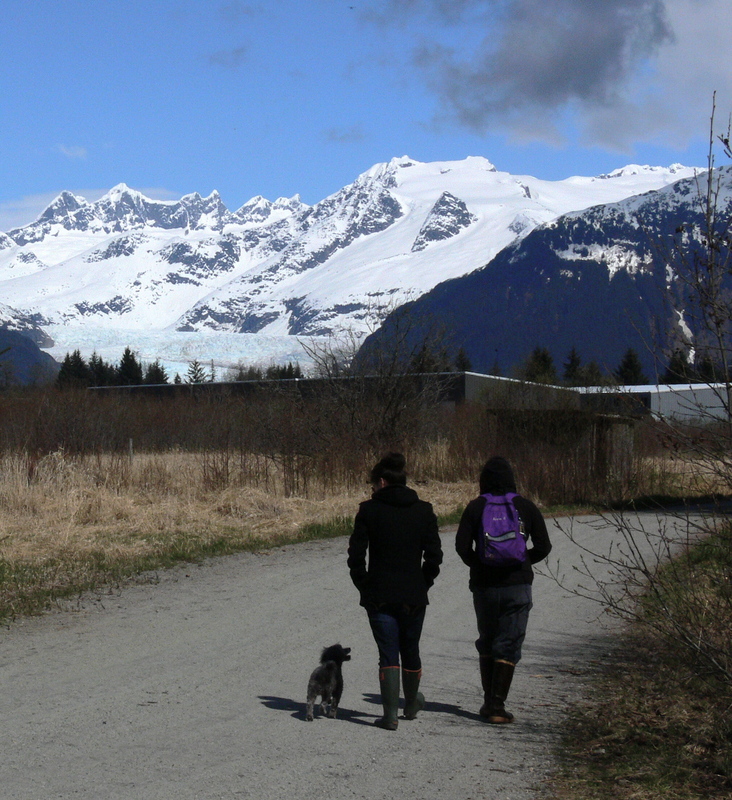 Later Aki takes the whole family hiking across the Wetlands which offer great views of glacier, ocean, and mountains. Aki only has eyes for her orange frisbee. Her three humans take turns tossing it over the still dead grasslands. When she she watches its trajectory she manages a quick retrieve. Most times she breaks into a run before it is thrown, often in the opposite direction. This leads to a desperate search spiced with ignored hints of “warmer” and “cold” from her helpful family. The daughter, just back from college graduation decompresses on the wetlands, finding a sun warmed drift log just right for a lie down. Aki sits beside her holding the frisbee in what she thinks is a seductive manner. When that fails she brings it over to me for a toss. She lost most of the other three in an attempt to wash them. One was last seen clutched in the teeth of a husky that snatched it away from Aki while we were halfway up the East Glacier Trial. Aki, like many dogs, suffers from a short term memory deficit which gets her through the loss of the frisbee. A few minutes after her toy’s Viking funeral, she convinced herself that someone had secreted it away in one of the backpacks her human family members carry on hikes. After giving us a series of “I know you have it take it out and throw it” looks, Aki falls into a trot besides us to return to the car. We buy frisbee 5 on the way home. 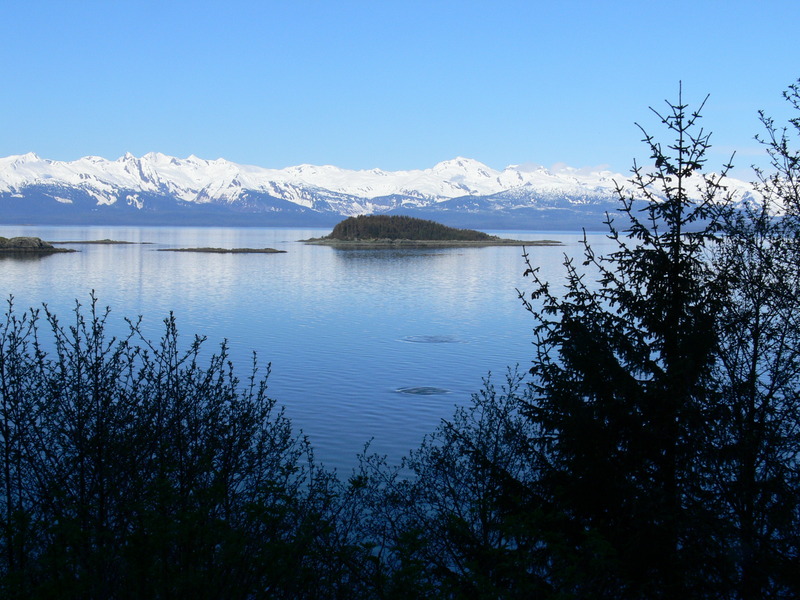 This entry was posted in Aki, Dan Branch, Juneau, Kwethluk, Nature, Southeast Alaska on May 11, 2011 by Dan Branch. Fifty years ago native plants covered this hillside. When spring followed a wet winter, it would turn orange with golden poppy blooms. I know, having seen it from the rear seat of Uncle Larry’s 57 Chevy on a sunday drive. Here on the coast clear air held nothing to diminish the view or color sunsets. On this trip smog thickened the sky until the onset of an off shore breeze. Housing developments now cover all by the steepest ground. For those that can afford hillside luxury its all golf, high end processed meals and cars. A life without hope of true peace. People at the bottom cling to a narrowing economic ledge. Some fall to homelessness or into the deportation center. Even the middle class have to spin many plates to avoid the fall to poverty. We find beauty here in the sea and in gardens dominated by foreign flowers. The birds still catch the early morning sun. 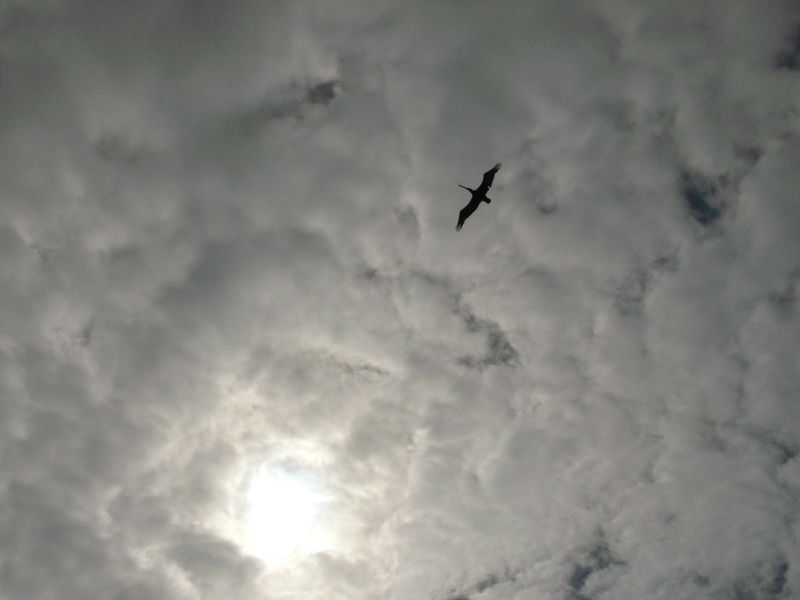 One morning I watched a line of pelicans float like rigid kites over beach and palms, bank and crash into the sea. Popping to the surface they flip up captured fish like pizza chefs and swallow them whole. I wondered if the locals still noticed things like this until a dog walker moves to the water and watches the scene with a posture suggesting wonder. This entry was posted in Dan Branch, Kwethluk, Nature, Poetry on May 10, 2011 by Dan Branch. spruce who expect no spring. in their still strong trunks. 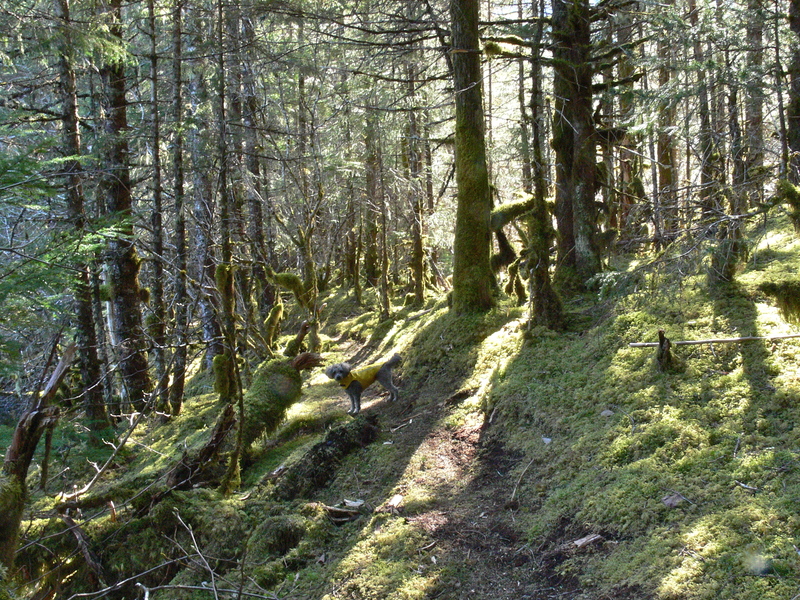 This entry was posted in Dan Branch, Juneau, Kwethluk, Nature, Poetry, Southeast Alaska on May 4, 2011 by Dan Branch.